Wine, Beer or Soft Drink? - Cider, Please! - Australian Wine Tour Co.
Home>Blog>Aust Wine Tour Co news>Wine, Beer or Soft Drink? – Cider, Please! Cider – not exactly the forgotten drink, but much overlooked – has been asserting itself of late. In fact one of the most popular visits on our new Bellarine Peninsula tour is to a house devoted to the making of fine cider. Until quite recently the only cider you were likely to encounter was likely to be a mass- produced hangover- in-a-bottle, made from fruit concentrate and laced with additional sugar. But the craft of making authentic cider from orchard fruit remained the preserve of the areas in which it had been made for centuries – areas like the English West Country, and Normandy and Brittany. That’s all changing, and Flying Brick, on the Bellarine Highway near Geelong, are in the vanguard of a cider- making renaissance. Flying Brick takes its name from nickname given by the locals to the black cockatoo that inhabits the Bellarine Peninsula – a bird so portly in appearance that its ability to fly seems to confound the laws of physics. Established in 2010, Flying Brick is reviving and extending the traditional craft of cider- making. They make three ciders; Original, Pear and Draught. 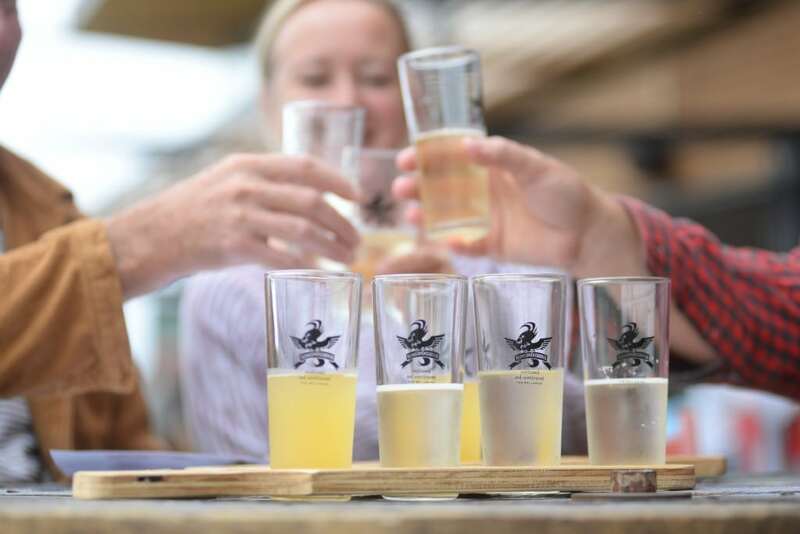 All are made using traditional methods, under the auspices of Flying Brick’s master cider- maker Nyall Condon, a veteran of Jack Rabbit Vineyard and Leura Park Estate. All have won, and continue to win awards. Traditional cider has a pretty wild reputation for potency, with alcohol concentrations usually somewhere north of 8%. Condon has managed to house- train his ciders, keeping the depth and character of flavour but at a less formidable alcohol content of around 5%. On “Bellarine Two” you’ll visit Flying Brick on the last stop of the day. As well as the cider house, it’s sleek new facilities include a stylish tasting room, where you’ll learn about cider- making and sample the ciders under expert guidance.